Contact the office nearest to you to find out information regarding current employment opportunities. Select a position below to find out more information. Premier Home Health Care is in search of an experienced and compassionate Nurse who understands the importance of meeting the needs of clients while helping them maintain a high quality of life. We are looking for a committed nurse who has impeccable communication skills and is able to problem solve on the spot. 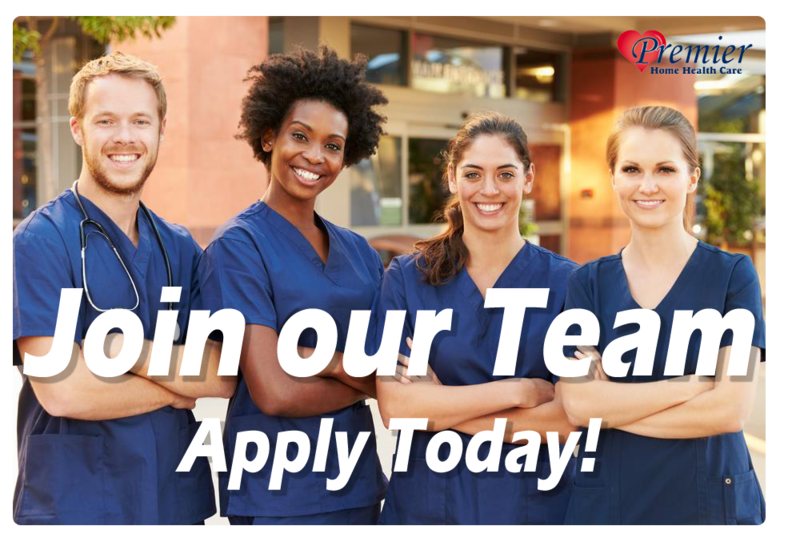 Our nurses have a reputation for being cheerful and receptive as they administer care to our clients, and we are seeking someone who would be a great fit with our team. Contact the office nearest to you for the most current employment opportunities for this position. Premier Home Health Care is in search of an experienced and compassionate Licensed Practical Nurse who understands the importance of meeting the needs of clients while helping them maintain a high quality of life. We are looking for a committed nurse who has impeccable communication skills and is able to problem solve on the spot. Our nurses have a reputation for being cheerful and receptive as they administer care to our clients, and we are seeking someone who would be a great fit with our team. The CNA will provide companionship to elderly and/or disabled individuals in their home or in a facility; while also assisting with personal care (bathing/hygiene, grooming, toileting, mobility), homemaker chores (meals, dishes, cleaning, laundry, shopping/errands, essential correspondence), and respite/companionship. The CNA maintains accurate daily records to be submitted weekly to receive a pay check. The caregiver must have reliable transportation to and from work, which includes functionality, fuel and valid insurance whenever applicable. All employees will adhere to state guidelines and regulations, company policies and procedures, and will provide the office with an updated availability schedule monthly. The Personal Care Assistant/Caregiver will provide companionship to elderly and/or disabled individuals in their home; while also assisting with personal care (bathing/hygiene, grooming, toileting, mobility), homemaker chores (meals, dishes, cleaning, laundry, shopping/errands, essential correspondence), and respite/companionship. Accurate daily records will be maintained and submitted weekly to receive a pay check. Also required is reliable transportation to and from work, which includes functionality, fuel and valid insurance whenever applicable. All employees will follow state guidelines and regulations, company policies and procedures, and will provide the office with an updated availability schedule monthly. Premier Home Health Care’s agency staff will provide companionship to elderly and/or disabled individuals in a facility/long term care or clinical setting. Agency staff will assist with personal and other chores/tasks assigned by the scheduled facility. The agency staff maintains accurate daily records to be submitted weekly to receive a pay check. All employees will adhere to state guidelines and regulations, company & facility policies and procedures..